The patterns of Nature are the bread and butter of an Earth Energy Dowser. Despite their overall complexity, the archetypal shapes are nevertheless few in number. It is part of the basic education of dowsers to learn to detect the lines of energy in the ground and in particular study the basically circular shapes associated with the crossovers of these lines. The so called Spider Web patterns discernible at such locations are key to the establishment of sacred sites, be they early neolithic structures, late medieval churches or in latter days, even crop circles. 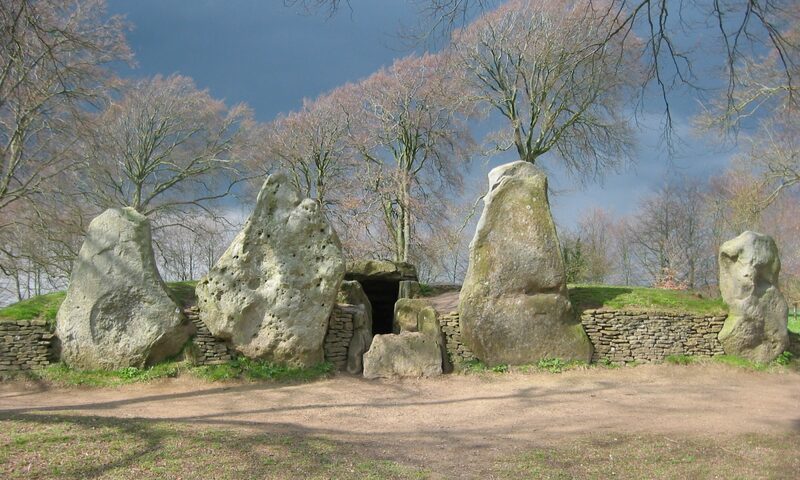 If, for the purpose of this discussion, we restrict our attention to Stone Circles, then it becomes possible to delineate the key parameters of these sites, in particular their plan form. We speak of Circles but in fact, it is rare to find anything that could be termed a true circle. Alexander Thom`s definitive study of many hundreds of Stone Circles showed that their form falls into a number of generic shapes. The bottom line is that in general the shape is closer to an ovoid or egg shape than a true circle. Pi лp = 3.14159… This is лp = 6/5 фf2 , more than accurate enough to do the necessary sums of the day. Theoretically, this shape was identified by Victor Schauberger in his work on the flow of water and the optimum vessel shape to contain it. Adapted here from ‘Living Energies’ – (p.72) by Callum Coates is Schauberger’s basic golden egg shape related to the pentagon. Added to this shape are the the key arcs which produce this shape and the location of the centres of these arcs in relation to the pentagon. Details of the algebraic relations which define this shape are given in Appendix 1. How then does this relate to the Earth Energy scenario? Several EEG members are well acquainted with The Golden Egg , having laid out this shape in their gardens to dowse; Fig. 3 shows Bob Sephton`s version. Bob found this shape not only in his garden but also in Stonehenge. Its major axis of alignment changes with the moon’s position. Billy Gawn and Dudley Wheeler spent some time chalking out the shape in fields in Northern Ireland. It was associated with this work that Billy made a key discovery. A true Golden Egg shape has the property of expelling from within it rising plumes of detrimental earth energy! In the world of physics, this shows remarkable similarity to an effect in superconductivity known as The Meissner Effect whereby lines of magnetic flux are expelled from a conductor at the point of it becoming superconducting, i.e the condition in which current flows with no resistive losses. Why earth energy plumes behave this way is still something of a mystery though this link of subtle energy flow to superconductors has been observed many times in research into dowsing. Detrimental earth energy plumes resemble the rising of heat plumes from a hot plate. Physically, they look like fountains of energy which terminate in scroll shaped patterns or more precisely toroids. These plumes are more correctly described as columnar vortices, first studied in the 19th century by Lord Kelvin. The generalised form of these vortices is well known and is the classic water vortex which manifests in characteristic form as a whirlpool. Its shape is in a form of what is termed a hyperbola. Fig. 4 shows a two dimensional graphical version, the basis of what is called a Rankine Vortex. From its simple equation y=1/x together with the simplest of equations y=x , it is shown in the figure how The Golden Ratio emerges as a property of this universal shape. When 1/x-x=1, it turns out there are two solutions to the resulting equation, namely x= 0.618.., 1.618.., the Golden Ratio and its inverse. Rotating this 2D shape around the y-axis gives us the 3D version which is the whirlpool shape, known to mathematicians as a hyperbolic cone. The associated pressure curve is shown which indicates the practical whirlpool form. This now brings us to the link to the topic of ovoids and The Golden Egg in particular. It is well known that slicing a straight sided cone at an angle produces a regular ovoidal shape known as an ellipse, the shape traced out by planets circling the sun. If we make a similar slicing of a hyperbolic cone however, we do generate an ovoid but this time it is asymmetrical, looking more like a birds egg. At one particular combination of parameters, namely a 450 slice at a height of close to 2.3345 units along the y-axis, then the resulting shape is to all intents and purposes a Golden Egg! (see Fig. 5). Why is it that this apparently odd height generates this special shape? It turns out that this number is one half of a key number in Nature termed Feigenbaum`s first number of Chaos – 4.6692… Recent research in a wide field of study including earth energies is indicating the importance of the manifestation of Chaos Theory in generating Nature`s Patterns.. ‘Order emerges from chaos’ and this is just the way it seems to be in dowsing earth energy patterns. Is then this number of Chaos theory totally new? Although its significance has been known for only around thirty years, it has strong links with both Pi and Phi as described above. Fig. 6 shows the linkages between these numbers and Feigenbaum’s number, denoted by δ. It has recently been shown that this number is inherent in the geometry of Cheop’s pyramid. The Golden Ratio appears in the height of the pyramid but in plan, a circle of the same perimeter as the total base length has a value which is (1/(sq.root f) + 1/d) see Fig. 7. This amounts to solving the ancient problem of squaring the circle! The significant observation made by Billy regarding the ability of the Golden Egg shape to control detrimental earth energy vorticular emanations now raises a further key question. How well do existing neolithic Stone Circles control earth energies ? A simple guide to answering this question is to calculate a parameter we shall term a Figure of Merit- FOM. Numerically this is the length of the perimeter of the Ovoid divided by the sum of the lengths of its major and minor axes. The closer this is to 1.6180339, the better the site is projected to achieve its detrimental energy clean up aspirations. Fig. 8 compares this criterion for a shape being a pure circle, a square and a Golden Egg. It is seen that a circle is below Phi, a square above it and clearly the golden egg is spot on. For a real circle, the figure for Castlerigg for example is around 1.615. As a matter of interest, the modern stone circle built by an EEG team in Ireland in 2000 (see EEG newsletter V5 Issue 19, Tony Hathway) had a value near 1.616. This Arigna formation was built on the principle of the stones being located at the crossing points of underground streams. It turned out that the basic geometry involved was tetrahedral! Another recent activity in the EEG has been the interest taken in cosmic energy beams striking the earth`s surface. These have been termed tachyon beams, based on the notion that supposed particles of this name are superluminal. The principle investigators here have been Gunther Schneck and John Cuninghame. The work to date indicates that a variable width beam of energy at close to 510 to the horizontal strikes a horizontal surface. This energy among other things can be used for healing purposes. Asking the question – what is the shape of the footprint when it strikes a surface? – yields an intriguing result. An experiment performed by both John and Billy with around a foot wide beam showed that the pattern was ovoidal in shape –see Fig. 9. However, it certainly was not an ellipse which would be expected if the beam were truly parallel. The fact that it is egg shaped suggests the beam is becoming divergent like a trumpet mouth as it strikes the surface. This is just like slicing the hyperbolic cone as noted earlier. The shape is tantalising. The basic model as outlined in Fig. 2 can be used with confidence to describe the shape but in this case it turns out that the ratio of the major to minor axes is the 2 divided by The Golden Ratio – 1.236. Thus again, the key number of earth energy appears once more, this time in slight disguise. This result now enables us to query the accuracy of the incident beam angle. To maintain consistency with other effects in earth energies, we would expect this angle to be related to tetrahedral geometry. Is it? In physics, we generally measure angles of incidence relative to the normal to the surface. If we take the key tetrahedral angle we find in dowsing, namely the Kelvin wedge angle of 38.9420, i.e 2 x 19.4710 as this angle, then the beam angle relative to the horizontal, is 900 minus this angle which is 51.0580. This is far too close to the measured angle to be coincidence! The often encountered ovoidal shape in earth energy studies has been viewed in the context of other shapes and numbers frequently found in dowsing. It has been shown that there is indeed very close linkage between the Golden Egg – the archetypal shape of life and the basic tetrahedral geometry of earth energies, as found for example in Stone and Crop Circles. An interesting mathematical relationship between the numbers of ancient science and the modern theory of Chaos has been uncovered. It now starts to link even pyramid geometry with the Fractal Geometry of Nature – a rather new concept in mankind’s philosophy of the Cosmos. Although much work remains to be done, at least it is now possible to see that the ancient morphologies of Nature are consistent with the newer chaotic dynamic visions now emerging. The missing link is that of Mind – the key to our ability to dowse. The connections here await an exposé at a later date. The angle b is a pentagon angle, i.e one half of 36o, the key numbers are ratios of the radius of the inner pentagon, 1/f², where the outer circle is assumed at unit radius. The radii for the golden egg are respectively – R1 is the radius of one nested pentagon greater than this value, R2 is the radius of the second nested pentagon plus R1 and R3 is the radius of the first inner nested pentagon. The work reported here would have been impossible without discussion and help from several members of the EEG cited above. I duly acknowledge their significant contributions to the ideas presented here. The hypothesising and conclusions nevertheless remain the responsibility of the author.